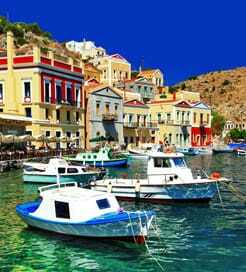 There is no shortage of options to choose from when it comes to selecting a ferry from Greece to Sporades Islands. There are 5 ferry companies with a combined offering of 22 Ferry Routes connecting Skiathos to Alonissos, Volos to Skiathos, Alonissos, Glossa (Skopelos) & Chora (Skopelos), Chora (Skopelos) to Alonissos, Glossa (Skopelos) & Skiathos, Alonissos to Chora (Skopelos), Glossa (Skopelos) & Skiathos, Skiathos to Alonissos, Glossa (Skopelos) & Chora (Skopelos), Glossa (Skopelos) to Skiathos, Chora (Skopelos) & Alonissos, Chora (Skopelos) to Alonissos, Glossa (Skopelos) & Skiathos, Volos to Skiathos, Alonissos, Glossa (Skopelos) & Chora (Skopelos), Alonissos to Chora (Skopelos), Glossa (Skopelos) & Skiathos, Glossa (Skopelos) to Skiathos, Chora (Skopelos) & Alonissos & Alonissos to Chora (Skopelos), Glossa (Skopelos) & Skiathos. The fastest route between Greece and Sporades Islands is Skiathos to Glossa (Skopelos) with a crossing duration of around 15 minutes. With so many routes on offer we make it simple by comparing all similar routes in one search so you can quickly find what you are looking for. The Sporades Islands are a Greek archipelago jutting off the east coast, in the Aegean Sea, to the north of Euboea Island. Of these sporadically placed, quiet islands, Skiathos is the most developed and cosmopolitan, owning some of the finest beaches in the Med as well. The remaining permanently inhabited members: Skopelos, Alonissos and Skyros, have charmingly rugged landscapes, authentically slow-paced villages and picture-postcard, azure waters. They also offer long networks of peaceful, pine-clad walking trails, taking you past beautiful monasteries and glistening lakes, ideal for exploring the hidden gems of the Sporades Islands. The easiest and most popular way of jaunting off to the Sporades Islands is by ferry, with leading operators providing dozens of frequent routes from the mainland and surrounding islands to numerous ports in the Sporades archipelago.